We were delighted to take part in the Napolina challenge to make some cool pizzas. 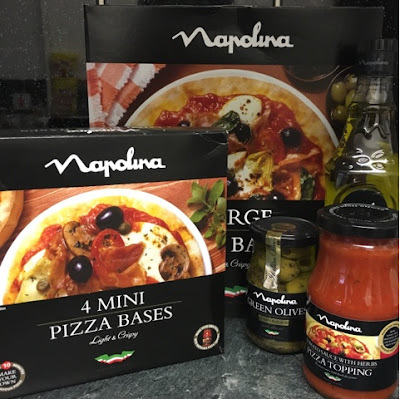 Napolina has a great range of pizza bases large and small as well as everything you could possibly need to get started from pizza topping to olives. The boys couldn't wait to get started, we gathered all of our ingredients on the table and we were ready to get started. We open our Napolina pizza bases, they were the perfect size for us to all to have an individual pizza, we then used the Napolina pizza topping and spread it over the pizza base, next we added a mixture of cheese's, It was great because we could then add any topping we wanted. That's the great thing about making your own pizza, you can personalise it to suit your taste. I like to add a little bit of everything, especially hot chillis which I couldn't have done if we were sharing. My son created this cool happy face using slices of green pepper for the mouth, onion rings and olives for the eyes and a tomato nose. We baked the pizza in the oven for 10-15 minutes until the cheese was melted and golden. We had an amazing time creating our pizza's, Not only was it great fun but we it gave us much more control of what we eat, I defiantly will be making our own pizzas from now on. Naoplina products can be purchased from all major supermarkets.